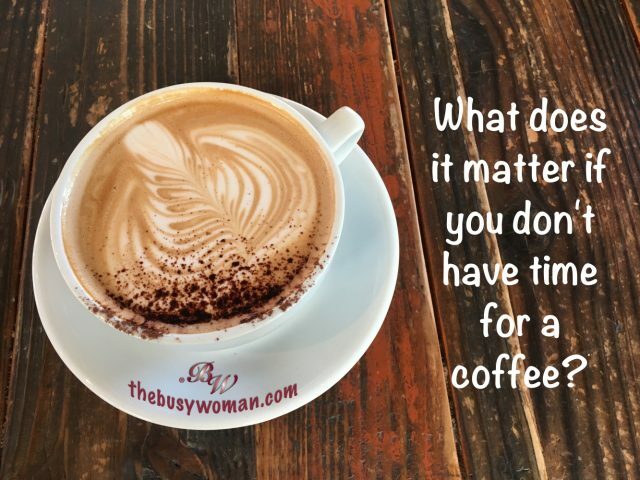 You are here: Home / Time Management / What does it matter if you don’t have time for a coffee? Can you bottle it to use later? I was cleaning underneath the kitchen sink and found FOUR different bottles of dish soap, TWO empty Windex spray bottles, 12 sponges, TWO almost empty containers of disinfecting wipes, and more. There is a reason I will explain later, but for now, finding these made me think that while these are consumable and will eventually be used and replaced, the other stuff around the house is not. Your stuff – Can you bottle it to use later? It is not like a bulk container of soap that you use to reload your small container. Why do we stock up so much? How much time is it taking to manage all of your stuff? And what does it matter if you don’t have time for a coffee? I have less junk than most. None-the-less, I still have too much. Why for heaven’s sake am I keeping it? This is the big question of the century folks! I can go into almost anyone else’s home or office and see so clearly how to help them declutter. Yet, it has taken me forever to do it for myself. And I honestly work at it! More than that, managing the stuff or looking for what I need among the stuff is robbing me of time such as sitting on the porch enjoying a cup of coffee. I have said this all over the Internet but in case this is the first blog post of mine that you are reading, I recently got rid of about forty forty-two boxes of stuff. Before I moved a few years ago, I got rid of more than I can think of. Let’s just say that I took a full garage down to one-third of a garage full of stuff. When I clear my schedule to work at it, I get a lot done. There is still so much that I am not using. If it is not consumable and I do not need it, out it goes. Aside from snowmageddon number two since moving here, I’ve been working at getting rid of the rest of my stuff a little each week. Then, I take two to three weeks off. No two households are alike. In my home, there is his stuff, my stuff, and our stuff. Maybe it’s our age that takes us full circle into the mode where things no longer matter. It’s an age where time with people matters, enjoying a sunset matters or taking a walk along the river matters. It is through these life lessons that I learned and got to this place. A. There is too much for me to do alone. B. It needs to be done in a short amount of time. C. I’m not sure what to do with some things. D. One day I’ll need or want it. E. I don’t have enough time. A/B. You do not have to do it alone and if it needs to be done in a short amount of time, hire help or invite friends over for drinks to help you work through the boxes. D. One day you will need it, want it, etc. You either need/want it now (or in the near future) or you don’t truly need it. If you don’t need it now, toss it. If you really want it then keep it and find a place for it. If you only think you want it but do not know if you’ll use it, toss it. E. You DO have the time if you plan your time. Every (fill in the day) you are going to spend (fill in how much time) going through (fill in the blank). As for me, I’ll be taking one hour each Friday to go through the rest of the boxes in the garage, one-box-at-a-time. If I have to wake up early to do it, so be it. I also decided that on Friday’s I will take one hour to do my books like I used to. If I have some free time and am in the mood, I’ll tackle some more boxes. ~ for the things in my garage and home that are my daughters and patiently wait for clear weather to make a third trip to her home. ~ when we are under three feet of snow. ~ to my husband for the things he still has to go through. I no longer accept things my father tries to get rid by giving it to me and adding to my stuff. And finally, I do not care if it is free. I do not take it. Update: Yesterday, I got all of the Clinique goodies that come for free when you purchase. I had to go back today and took the things I didn’t want from the freebies (they come in a sealed bag) including the large purple tote and asked them if they could give them to someone else. They obliged. If you were curious as to why I have so many dish soap containers, I am allergic to most scents on the planet. There is one type of Dawn detergent with a scent I can handle. It’s often sold out, or the company changes the size or label of the container. Two containers are the Dawn I can use, and two are scent free, environment-friendly bottles that we wanted to try. Now it’s your turn. Post your plan in the comments below. Let me know if I can help.